New Jersey: Doubleday, 1951. Bound in faded blue/green cloth that has an outline of a young lady in yellow to front panel, and yellow lettering to spine. Shows darkening to page edges and wear to extremes. Dustjacket has chipping to top front panel, spine ends, corners and overall rubbing and scuffing to flaps at folds. 223 pgs. Priced accordingly. Basis for the TV Show of the same name. . First Edition. Hard Cover. VG+/VG. 8 1/2" X 5 1/2". NY: Warner Bros., 1999. A tribute to one of the "giants" of Hollywood, film and television. Laid in is a letter that was sent from the Wolper Organization to the William Morris Agency -- and it is signed by David L. Wolper. 224 pp. Bound in glossy wraps. . Signed Letter Laid in. First Edition. Soft Cover. Very Good/No Jacket - As Published. Folio - over 11" X 14". NY: Lancer, 1970. Overall, a tight, clean unread copy of this paperback original. The first book in the Nanny series. An unusually nice copy! 158 pp. . First Edition. Soft Cover. VG++/No Jacket. New York: Bantam, 1971. Based on the television series, Primus undertakes an aquatic adventure in this 140 pp. paperback.. First Edition. Soft Cover. Near Fine/No Jacket. New York: Dell, 1977. From the NBC-TV series, Mark Harris swims in his first paperback adventure in 204 pp.. First Edition. Soft Cover. Near Fine/No Jacket. Greenwich, CT: Fawcett Gold Medal, 1975. Based on the NBC-TV series with David McCallum. 192 pp.. First Edition. Soft Cover. Near Fine/No Jacket. NY: Starlog, 1981. Tight, clean copy of this 98 pp. 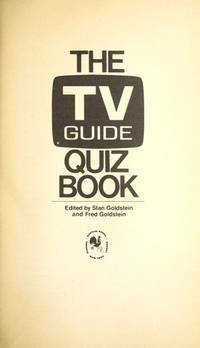 book on the TV shows in the early 1980's. . First Edition. Soft Cover. Near Fine/No Jacket. Illus. by Photo-Illustrated. 4to - over 9¾" - 12" tall. New York: Bantam Books, 1978. Mass-Market paperback; Illustrated with 192 original program pages from TV Guide, in black & white; 307pp.. First Edition. Soft Cover. VG++/No Jacket. New York: Ballantine Books, 1977. Based on the NBC-TV spectacular starring Sir Laurence Olivier and Anne Bancroft; bound in wraps; 16 full color pages of photos from the film; 133pp.. First Edition. Soft Cover. VG+/No Jacket. Lucy & Ricky & Fred & Ethel; The Story of "I Love Lucy"
New York: Popular Library, 1977. Bound in wraps; 32 pages of black & white photos; 352pp.. First Edition. Soft Cover. Near Fine/No Jacket. Illus. by Photo-Illustrated. New York: Bolder Books, 1975. Bound in stiff, glossy wraps. Originally published in hard cover by Drake Publishers as "Nothing in Moderation"; illustrated in black & white; 245pp.. First Thus. Soft Cover. VG++/No Jacket. New York: Collier Books, 1977. Bound in thick wraps; black & white photos; 179pp.. First Edition. Soft Cover. Near Fine/No Jacket. Illus. by Photo-Illustrated. New York: Workman Publishing, 1986. Bound in thick glossy wraps; black & white photos; 224pp.. First Edition. Soft Cover. Near Fine/No Jacket. New York: Ballantine Books, 1976. First Ballantine Books mass-market paperback printing; based on the NBC-TV adventure starring Roger Moore and Patrick MacNee; 153pp.. First Thus. Soft Cover. Near Fine/No Jacket. New York: Holt, Rinehart and Winston, 1983. Based on the Television film 'Kennedy'; First American edition in price-clipped DW; profusely illustrated in color and black & white; 176pp.. First U.S. Edition. Hard Cover. Near Fine/Near Fine / Price-clipped. 4to - over 9¾" - 12" tall. New York: Beekman House, 1984. Hundreds of questions and the answers by the editors of Consumer Guide; profusely illustrated in color and black & white; 64pp.. First Edition. Hard Cover. Near Fine/Near Fine. 4to - over 9¾" - 12" tall. New York: Trite Expectations, Inc., 1980. Summer, 1980 issue; Vol.1, No. 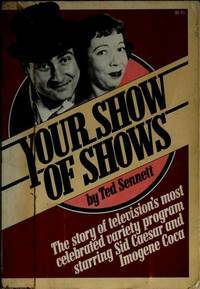 1; Sid Caesar interview; articles on Buster Keaton, "The Gong Show", Jim Backus, Howard the Duck, The Flying Karamazov Brothers, and much more. ; black & white photos and illustrations; 64pp.. First Edition. Soft Cover. Near Fine/No Jacket. 4to - over 9¾" - 12" tall. Magazine. Brooklyn, NY: Topps Fan Magazines, 1965. First Issue of "Soupy Sales" magazine; color covers; black & white interior photos; small bit of Christmas scotch tape to top front cover; 66pp.. First Edition. Soft Cover. VG+/No Jacket. 4to - over 9¾" - 12" tall. Magazine.